Natalia hasn't left the Di Sione estate in years, but must retrieve her grandfather's lost book of poems from formidable tycoon Angelos Mena—who's just mistaken her for his daughter's nanny! Angelos offers untold pleasure—but will he take her heart? Fleeing royal scrutiny places Sophie under the searing gaze of notorious billionaire Rafe Carter, who can't resist a forbidden taste of his chef. But when her identity is revealed, Rafe is duty bound to rescue the beautiful princess…with a convenient vow! Surrounded by society's glitterati, Arden Wills is confronted with her first and only love, Idris Baddour—a man she never knew was a sheikh! When their ardent kiss is blasted across the world's media, Arden's secret comes to light—the sheikh has a son! 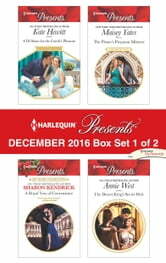 Be sure to collect Harlequin® Presents' December 2016 Box set 2 of 2!